and responsible for the administration of Federal Capital Territory Abuja under the military junta of Sani Abacha. He had his primary education at Langtang, Plateau State from 1950 to 1957. He then proceeded to the Nigerian Military School , Zaria from 1957 to 1959. He was at the British Army Apprentices, College chepstow, England from January 1959 to December 1961 where he obtained a Senior Certificate of Education. He passed the Young officers Transportation course in England, he also has a Diploma in Advance Military Transportation, USA. It is worthy to also note that he is a fellow of the Nigerian Institute of Management, fellow of the Chartered Institute of Transport(Nigeria and British Chapter) and a fellow of the National War College(FNWC). He served in various capacities as Minister of Transport and Quarter Master of theNigeria Army. 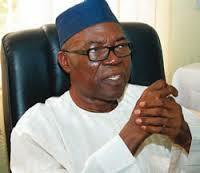 Useni also served as vice president of one of the major parties in Nigeria, the All Nigeria Peoples Party(ANPP). Useni reached the height of national attention in Nigeria when he was appointed military governor of Nigeria’s defunct Bendel State in January 1984. In 1998 Useni, the then minister of capital territory Abuja, was rumored the successor of General Sani Abacha. In August 2001, Jeremiah Useni was appointed head of the delegation of the Arewa Consultative Forum to meet and discuss common objectives with governors of the northern states and other leaders. In 2003, he was Deputy National Chairman North for the All Nigeria Peoples Party (ANPP) In November 2004, he was locked in an internal struggle with ANPP Chief Donald Etiebet, the National President . In May 2006, he left the ANPP to become president of a new party, the Democratic People’s Party, taking other members of the progressive wing of the ANPP. However, he was suspended indefinitely in December 2008 when he said the death of Ken Saro-Wiwa was a national sacrifice. He ran for the Plateau South senatorial seat in the April 2011 elections, under the platform of the Democratic People’s Party(DPP) but was defeated by Victor Lar of the People’s Democratic Party(PDP). In the 2015 elections, he again ran for the position but this time around, he won under the platform of the All Progressive Congress(APC). He Defected to the APC, just before the April 2015 elections. Despite the renewed attacks by the dreaded Boko Haram sect, former Minister of the Federal Capital Territory, FCT and Senator-elect for Plateau South Senatorial zone, Gen. Jeremiah Useni says he is optimistic the administration of Gen. Muhammadu Buhari will crush the sect. Useni urged Nigerians to be patience and support the new administration in its bid to put an end to insurgency and reposition the nation for the good of the citizens.